A STRONG “NEIGHBOR HELPING NEIGHBOR” ETHIC has been alive in the Caribbean for many generations. The 2017 Caribbean hurricane season gave us the opportunity to see the spirit of community in action across a broad swath of islands, as major storms — namely Irma and Maria — landed direct, devastating hits. 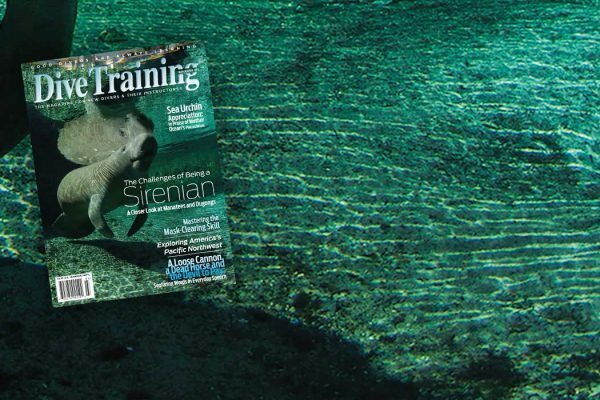 In the first week of September the Dominica Watersports Association received a phone call from Jerry Beaty, associate publisher of Dive Training magazine, who had just gotten off the phone with Clay McCardell of the Explorer Ventures live-aboard company. Clay had wisely moved his Caribbean Explorer II dive live-aboard from his homeport in Saint Marten ahead of Hurricane Irma and safely rode out the storm in Dominica. Jerry explained Clay had reached out to him, because Saint Marten had been devastated by Irma and Clay was eager to load his boat with relief supplies in Dominica and return home to aid his neighbors. He’d contacted Jerry because of Jerry’s connections in the scuba industry. Jerry put several key people in touch with Clay and on September 13, 2017, Clay’s Caribbean Explorer II motored from Dominica to Saint Marten with over 10,000 pounds (4537 kg) of much-needed emergency supplies donated by Dominica Watersports Association members and organized by our local Red Cross and government officials. We were proud of our efforts and we felt gratified to have the opportunity to help our Saint Marten neighbors in need. Only five days later, on September 18, 2017, we were the ones needing help after Dominica took a direct hit from Hurricane Maria. The damage to our beloved island was heavy and widespread. Just like our neighbors in Saint Marten less than a week earlier, now we were relying on helping hands to reach out and prop us up while we began the slow process of recovery. And once again, members of Dominica’s dive industry played a crucial role in working with government officials to move around crucial supplies and aid workers by sea. Only the dive boats that fled to Saint Lucia ahead of Maria could help, as all boats that stayed in Dominica were either destroyed or disabled because of the hurricane. The few boats that could help worked day and night to assist in the rescue efforts and, despite many of the crew losing homes and worrying about families, they put in long hard hours helping their country. So here we are one year later and, as we look around, we realize that despite everything our small island nation has endured, the Commonwealth of Dominica — “The Nature Island of the Caribbean” — is indomitable. Our people and our natural resources cannot be subdued. High winds and storm surge might have wiped the smiles off our faces and destroyed the lush blanket of tropical beauty that covers our land — but only temporarily. By the sweat of our brows and the assistance of many, our smiles have returned and our hope is restored. Those who visit Dominica know that you don’t come here just for diving. You come here to be part of a family of people who are proud to show off their beautiful home and to welcome you as a treasured guest. 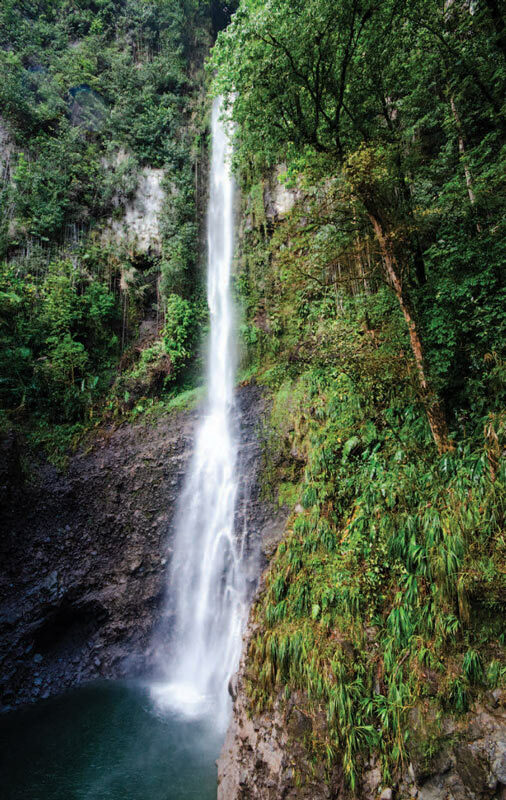 Dramatic waterfalls adorn Dominica’s mountainous terrain. Photo by Jack Henderson. Dominica is located in the Windward Islands, between the French islands of Guadeloupe and Martinique in the Eastern Caribbean. The Dominican Republic is a completely different country located 624 miles (1,004 km) to the northwest. The largest and most mountainous of the Windward Islands, Dominica covers 751 square miles (1,945 km2), is 29 miles (47 km) long and 16 miles (26 km) at its widest. Much of the island is set-aside as National parks and reserves. The 17,000-acre (6,900 ha) Morne Trois Pitons National Park is a UNESCO World Heritage Site featuring several crater lakes and stunning waterfalls. The Northern Forest Reserve is an oceanic rainforest that is home to the rare and exotic Sisserou parrot, Dominica’s national bird, and the Jaco (or Jacquot) parrot, both of which are found nowhere else in the world. Dominica lays claim to other “found nowhere else in the world” attractions. These include Waitukubuli National Trail (called the WNT), a 114 mile (183 km) hiking trail that extends the length of the island from Scotts Head in the south to Capuchin in the north, and Boiling Lake, one of only two such natural phenomena in the world. It has more volcanoes (a total of nine) than any other island. It also has 360 rivers. 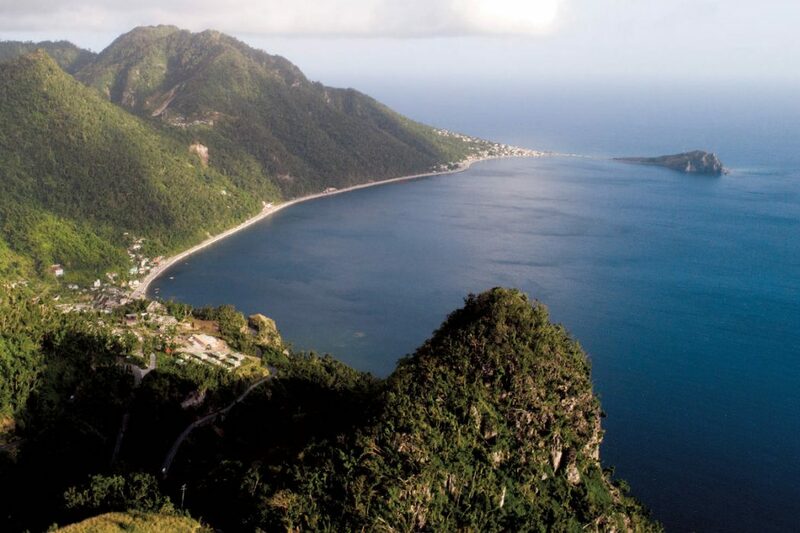 Dominica lays claim to “found nowhere else in the world” attractions. Dominica was among the last of the Caribbean islands to be settled by Europeans, presumably because the local Carib people put up a fight. The Caribs, originally known (and still locally referred to) as the Kalinago people, are said to have migrated from South America by dugout canoe. Inhabitants since about 1,000 AD, they named the island “Waitukubuli” which means, “tall is her body” and no doubt refers to volcanic mountain peaks reaching more than 4,600 feet (1402 m) into the sky. Descendants of the original Kalinago people reside in the Kalinago Territory on 3,700 acres (1,497 ha) of land on the island’s Northeast region. This is the only remaining settlement of indigenous people in all of the Caribbean. They have assimilated into local culture while also retaining their traditional culture, which can be experienced by visiting the village of Kalinago Barute Aute. The island’s economy is based on agriculture and tourism. Underwater photographers have lots of targets on Dominica’s reefs. Photo by Jack Henderson. Dominica is home to some of the most colorful, vibrant reefs, pinnacles and walls in the Caribbean. We’re thankful that most sites sustained little storm damage. Some shallow sites lost delicate sponges and some stony corals got tossed, but visiting these sites is interesting because it allows us to see how quickly nature’s restoration process works. One thing that’s the same is the underwater visibility, which is consistently in the 80-foot (24-m) range. Average water temperatures range from 78 to 84 degrees Fahrenheit (25 to 29 Celsius) so a light wet suit or Lycra skin suit is all you’ll likely need. Some unusual and interesting diving in Dominica can be done from shore but most sites are reachable by boat. The first thing most divers remark about are the sponges, which punctuate the reef with bright shocks of color. Again, some sponges on shallow reefs were damaged but the gigantic barrel sponges on deeper sites remain intact. Fish life, which is prolific, is also diverse. For some strange reason, since the hurricane we’ve seen more queen angelfish than ever before. Schooling French grunts, creole wrasse, silvery horse-eye jacks, southern sennets and the ever-present yellowtail snappers adorn the reefs. Keen-eyed macro lovers will enjoy spotting seahorses, frogfish, batfish, several shrimp species, varied crab species and lettuce sea slugs. Seasoned dive guides will help point these beauties out for you. The wild east coast is unprotected from the Atlantic wind and swell, but on calm days there is some fantastic snorkeling to be enjoyed. 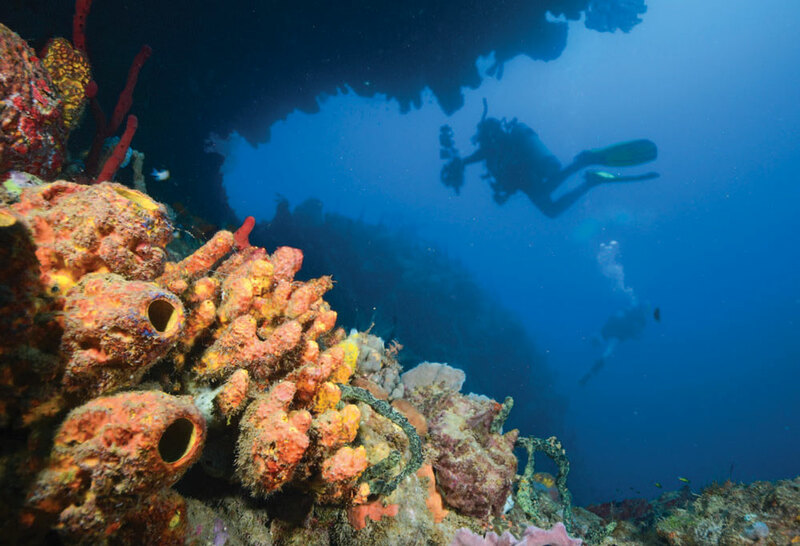 The leeward west coast faces the calmer Caribbean waters and is where most dive operators are located. The west coast can be divided into three diving regions: south, central and north. Each has its own unique feel. The southwest is where the famous Champagne reef dive is located, named for the tiny bubbles rising from the porous limestone seafloor, evidence of the island’s volcanic origins. The shallow areas of the reef sustained some hurricane damage, but the deeper area is fine. Champagne can be reached from shore and is perfect for snorkelers and divers. Off Pointe Guignard is an extensive reef system that starts shallow and runs into the abyss. Divers wishing to venture deeper will marvel at Danglebens Pinnacles, a series of five craggy underwater pinnacles that rise to within 35 feet (11 m) of the surface. Most of the dive is spent between 50 and 80 feet (15 and 24 m). There’s often a mild to moderate current here, meaning you’re likely to meet up with massive schools of jacks, barracuda and yellowtails. Scott’s Head Drop Off is another stunner, starting at 40 feet (12 m) and dropping off to 100 feet (30 m). Sponges, sponges and sponges dominate this dive and the varied topography gives lobsters, shrimps, crabs and moray eels a lot of hiding spots. Heading north from Scott’s is Crater’s Edge, another volcanic ridge that attracts hoards of schooling fishes. 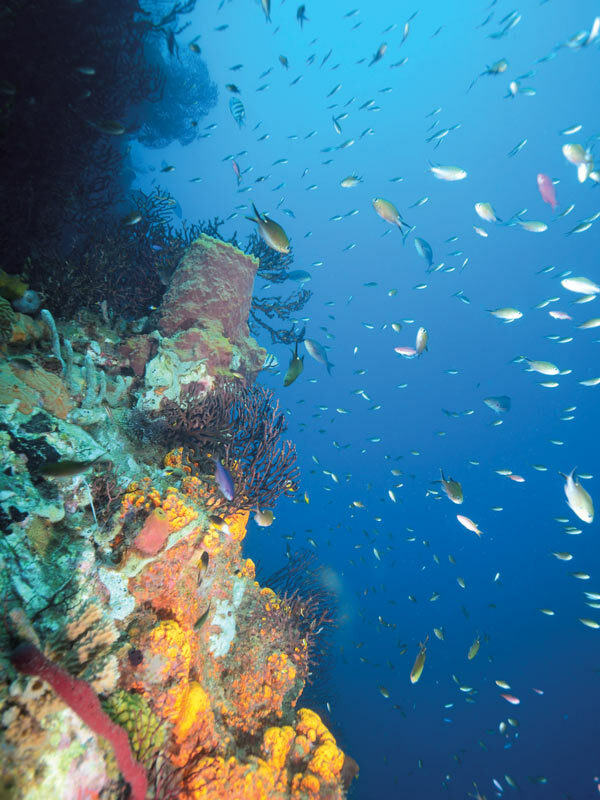 The Central Coast features underwater topography somewhat different from southernmost dive sites, in the form of fringing reefs with overhangs, tunnels and arches. Nose Reef and Whale Shark Reef are situated on the south drop-off of the Grand Savanne Flats. Here, ridged fringing reefs are covered in sponges and coral growth and are loaded with critters. Nearby Rina’s Hole is a shallow site noted for a swim-through that leads to a series of rock formations adorned with sea fans. A cave-like structure is stuffed with soldierfish and bigeyes. Continuing northward, divers will be enthralled by Toucari Caves, which features swim-throughs that make great photo opportunities. Just to the north of Cabrits is the wreck of a small inter-island ferry covered in colorful marine life. Dominica is known as a prime cetacean-watching destination. Species commonly seen here include several dolphin species, pilot whales and false killer whales. A resident population of sperm whales can be spotted cruising close to shore. Whale watching tours are very popular here. The government is carefully controlling these activities in order to protect the whales and issue a limited number of permits allowing in-water viewing. If you’re lucky, you might be treated to a dolphin or whale sighting during a surface interval. While not all dive operations have reopened at press time, many are back in full swing. Visit the Dominica Watersports Association website, dominicawatersports.com for more details. Oh, and save the date: Dominica’s annual Dive Fest takes place July 5 to 14, 2019. Although advances in technology allow for improvements in all areas of our lives, sometimes we have to give a nod to the good old-fashioned ways of doing things. Our own Fort Shirley in Cabrits National Park is a prime example, as it held strong against battering storm winds, thanks to its solid construction. Today the grounds are open for all visitors from student groups to weddings to anyone wanting to learn more about local history. The majority of all hiking trails have reopened and the island celebrated a successful 10th Anniversary Hike Fest last May, which included guided hikes along portions of the Waitukubuli National Trail, the Caribbean’s longest hiking trail. The entire trail hasn’t been cleared and reopened yet, so visit dominicaupdate.com for news of our progress — which is coming along nicely due to the efforts of our Forestry workers and local and visiting volunteers. Speaking of festivals, Dominicans know how to party. Events commemorating local culture, music and dance are celebrated throughout the year. Many were scaled back in 2018 during recovery efforts, but you can bet they’ll be going big again in 2019. Check the website discoverdominica.com for festival dates and details. When you’re done diving and hiking you’ll enjoy shopping the small open-air markets for fresh fruit and locally made handicrafts. Various beachside bars and restaurants are back in full swing, ready to serve up authentic Caribbean-creole cooking. If you have visited Dominica in years past, there’s no doubt you’ll notice that our little gem of an island took a hard hit. You’ll see renovations are ongoing. But what you’ll also see is the resilient spirit and the bright smiles of Dominicans who are proud of what we’ve survived. Come check us out. We’re well worth a visit right now.